"Beginning April 2, there will be no cost for data migrations with the purchase of a new Mac or data transfers with a repair," an Apple store operations specialist informed TidBITS. The question arose when a reader of the site was recently told his iMac migration was free. AppleInsider was not able to confirm that all services venues were aware of the new policy, with about one quarter of the venues we polled not aware of the change. 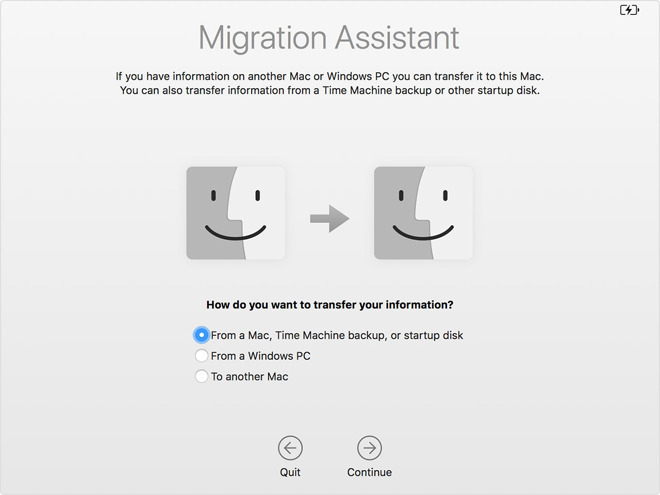 Apple does offer tools and instructions for migrating Mac data without help. People who can afford to go without their old machine may enjoy the convenience, but in some cases may have to wait several days if there's a backlog of customers and/or there's a large amount of content to transfer. The need for manual migration has diminished in recent years as a result of cloud services and faster internet connections. Signing in with an Apple ID, for instance, will let Mac owners grab files from iCloud Drive, stream from Apple Music, and regain access to iTunes purchases. There are also multiple dedicated online backup services, and online stores will typically let people reinstall missing apps. Restores are even simpler on iOS devices, since Apple offers its own full backups via iCloud or iTunes.